The Mom of OZ: Wii are having too much fun! 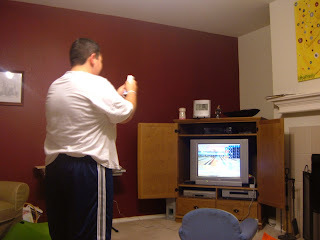 Just a quick post to say that - despite my frugal intentions, Kyle talked me into a Nintendo wii. I am so glad he did - that thing is too much fun! He first played it at an Elder's quorum "man-richment" night - and fell in love. (In case you are wondering the men's idea of an enrichment night is to play video games for hours.) LOL He was in line for three hours the next night getting one. We have had to rearrange furniture to have room to play. Right now tennis is our favorite - and we use every square inch of our gameroom playing - we are all over the place. Bowling is fun too and we all bowl exactly like we bowl in real life - I even do that spastic thing with my feet. If you get one - get the extra controllers - you can play up to four players at once -its so fun and not too hard. The kids play tennis with us. Oh yeah and you also build your little player called a "mii" to look like you - they are so cute! Ok I have to go practice my golf game on it now! My friends have a wii and love it! They are particularly fond of bull riding and boxing. I'm glad you splurged-have a blast! ok so im hallies sister and i was doing a little blog stalking and saw your blog....ive totally been wanting to buy a wii for my husbands birthday..and youve inspired me to do it!!! So what games would you choose?